And then you recall the time when you first believed that your sins were forgiven. Gone : dispersed : never to return : flung into the deep sea of God’s forgetfulness. And you recall that first tinge of joy and the astonishment that you are forgiven.. and life becomes wonderful and you bathe in the gracious presence of God’s love. And thankful prayers are proffered to God.. and supplications are wonderfully answered.. and the gospel of grace is shouted abroad – and others come to know your God. And the first flush of first love wells up within your heart of ecstasy. But then, slowly… you realise that things are not the same as they were at first.. and then you start to question.. am I really saved? Am I really forgiven? Am I really accepted? Am I really loved by God? Have you ever looked back over your life and really just wondered? Well I have.. And most believers I know have at one time or another asked such questions. Then you look at other believers with an impaired understanding – and judge. It seems that even if I am saved, He cares for them more than me! It seems God prefers others to me – look how He’s blessed them! Have you ever looked back over your life and really just wondered .. Well I have.. and most believers I know have at one time or another tried to justify such thoughts. Well it’s impossible to build up a trust in God if you live with such doubts. It’s impossible to trust God with such fears and worries, and such justifications. If for one moment you still have such any doubts and fears, they need to be addressed. If you ever consider God has favourites, and you’re not one.. that must be dealt with. If you still have such doubts, fears, concerns, worries or such false perceptions.. these need to be addressed as a priority. If you have not once and for ever accepted your acceptance by God.. you will live a defeated life until the rapture or your death – and this is a non-negotiable fact in Scripture. 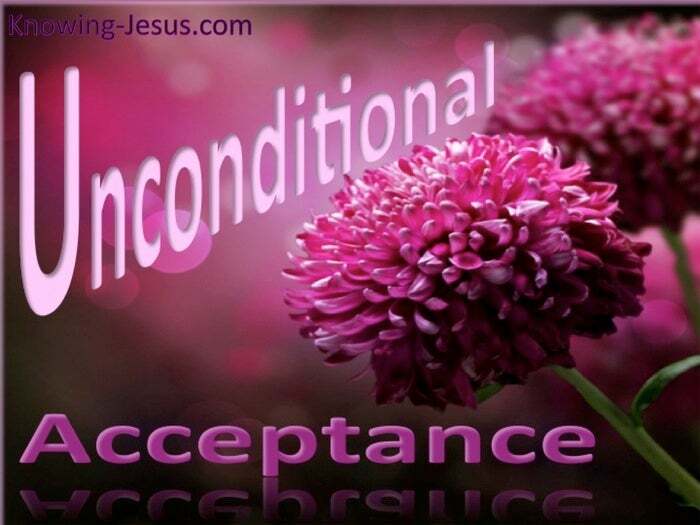 If you have not once and for ever accepted your acceptance by God.. you will live a defeated life until the time that you die or until Christ returns. This is not the will of God for you.. for God sent His Son to die – for love of you. Page after page of scripture screams the reverse of such ill-conceived thoughts. Read, mark and learn: Ephesians 1:6: He hath made us accepted in the Beloved. Live, walk and sleep: Ephesians 1:6: He hath made us accepted in the Beloved. 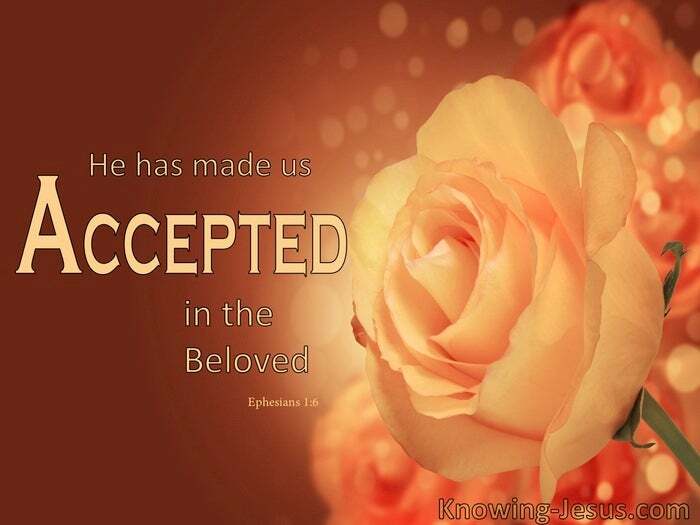 Know that you know that you know: Ephesians 1:6: He hath made us accepted in the Beloved. Accept this verse means what it says: He hath made us accepted in the Beloved. There is one and one basis alone for your acceptance and mine. We’re accepted by God in the Beloved. We’re accepted by God because of what Christ did on the Cross. Paul rehearses this truth throughout His inspired epistles: “Who shall separate us from the love of Christ? shall tribulation, or distress, or persecution, or famine, or nakedness, or peril, or sword? For I am persuaded, that neither death, nor life, nor angels, nor principalities, nor powers, nor things present, nor things to come, nor height, nor depth, nor any other created being, shall be able to separate us from the love of God, which is in Christ Jesus our Lord.” Romans 8:38. Who is God that He should lie. His Word is truth. His promises are altogether sure. He is faithful and He is true to His word – He hath made us accepted in the Beloved.